While it might not be a holiday of great historical significance, Valentines Day holds a special day in the hearts of millions. 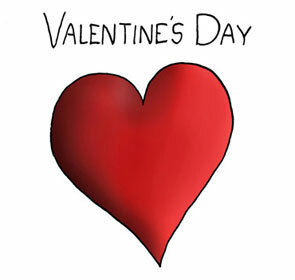 On February 14th, every year, millions of couples come together to celebrate their love in numerous ways. Some men choose this day to be the one where they finally propose marriage. Others choose this as the day to simply show their special lady just how much she means to them. But one thing everyone tries to do is make the day as special as possible for their significant other. Everyone has the dream of setting up the perfect Valentines Day that is planned to a tee with every detail in place. But the truth of the matter is that most people simply do not have the time or funds to put the dream Valentines Day together. There are even those who still have no idea what to do even though the day is upon us. So here are a few ideas of ways to surprise your special someone that won’t take a lot of set up and time. It may be too late to get reservations to her favorite restaurant or any restaurant that is Valentines Day worthy, but it is never too late to go down to the local supermarket and cook her favorite dinner and make her a special dessert to show her how much she means. If the weather is nice and you don’t have work during the day, setting up a picnic under the sun at the local park is a good way to go. Not everyone is a 5-star chef so bringing a simple lunch and some snacks to share during the day while you spend time alone enjoying the outdoors is a solid move. It might not be the most original idea, but it is a time tested one. A good move for any guy on Valentines Day could be as simple as surprising your wife or girlfriend with the red roses she’s been dreaming of. These could always be followed by the picnic or dinner surprise. Tip: We found that FTD has the best deals this year and you can still order for same day delivery by clicking here to claim 25% off. Either taking her to a movie or watching a movie at home is a safe idea. You can’t go wrong with a movie that you both enjoy with some snacks. It might not be a carriage ride through the park, but it is a relaxing evening alone with that special someone. Although not recommended as the primary nor only thing you do for Valentine’s Day, you can start the day right by sending her an ecard to her work email to cheer her up first thing in the morning. Then have your primary surprise in store for later in the day. Tip: You can send a free ecard here. So while Valentines Day is upon us, you might not have had anything planned out just yet. The options above are just enough to leave her happy going into February 15th. And if those ideas don’t tickle your fancy, you can always do the secret final option: something that you hate, but she loves. Let her know just how important she is by doing something you normally would not do, just for her.